Are you reading the truth or a pack of lies on social networks? Learn to tell the difference with this quick guide. From the poor mutts in dog homes that are about to close, to the Statue of Liberty at the center of a tsunami – you’ve no doubt seen these sorts of messages on social networks and been suitably shocked or awed by them. You may even have clicked Like, Retweet or Share. What these viral messages have in common is that they create such an impression that they are often shared further without any serious thought being given to them. And that’s a pity, because in most cases the events have either finished (that dog home closed ages ago), or didn’t even happen (the Statue of Liberty is still standing). 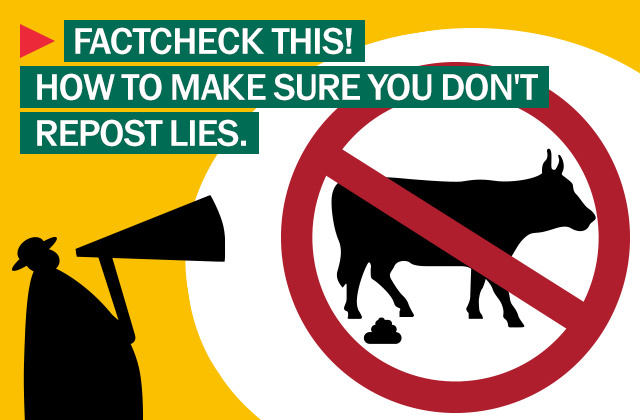 Convincing text as well as the use of Photoshop can make it difficult to distinguish the truth from the lies; it now entails some key skills familiar to a modern journalist – the ability to check facts. A modern journalist has to work so quickly that some inaccuracies are inevitable. That’s why even largest news outlets like BBC and CNN publish factually incorrect information from time to time. But they correct such mistakes as soon as the situation becomes clearer. That’s the key difference from minor sites and personal blogs, authors of such blogs rarely bother writing retractions. So the general rule is: big and reputable news agencies are more trustworthy, smaller and specialty web sites deserve less trust and blogs and social networks. deserve the least amount of trust. However, blogs and social networks are especially challenging to disregard as we are inclined to trust friends. If you read a story with an emotional presentation of the facts, exaggeration and the absence of proof, it’s wise to check all the facts mentioned. The information may be outdated (especially relevant if you’re reading to a call for help/charity/etc.) or totally untrue. It takes only a minute to check it yourself. It is worth knowing that cybercriminals actively use misinformation to allure victims to malicious websites. They typically use important and current news. So, before clicking that link to learn more about an event, think about the news source and take measures to protect your computer. So, if we see a suspicious news article or a blog post, how do we check it? This isn’t the most reliable method, but it produces the quickest results. You open Google (or Bing or another search engine), enter the main details of the suspicious message and see what results are returned. The painstaking and more reliable way is to analyze the text in the links returned by the search engine – check who wrote them, compare the context – but most people don’t have time for that. It’s simpler to just look at what sites the texts appear on rather than what is written. If no serious, authoritative sites (major news sites that don’t specialize in tabloid stories, official government sites, official company sites, etc.) appear on the first page of results and all you can see are discussions on social networks, then you can dismiss the whole thing as a hoax. We copy the headline and paste it in Google. 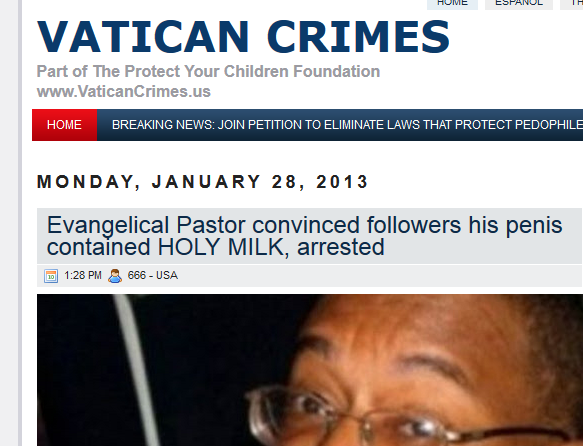 The first result is our questionable article. After that it’s all forum discussions by shocked readers. To completely verify things, we click on the News tab to see the results from those sites that Google considers to be news. The result is pretty conclusive – not a single match. You can breathe a sigh of relief – that’s one less transgression that can be attributed to the church. 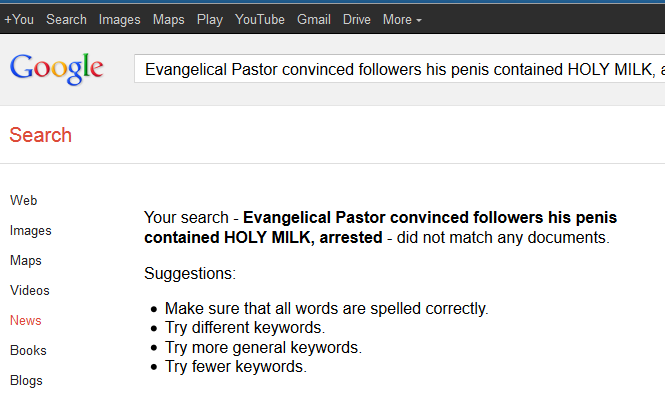 You can add the word ‘lie’ or ‘falsification’ to your search. Then you’ll immediately see sites dedicated to busting popular online myths. A more complicated method of fact checking which professional journalists use is to look for the source of the information. Official government sites will be the first port of call for information on legal or state-related activity. If the news concerns a product or a service, the company’s official site needs to be found (Google plus “XXXXXX official site” will help with this) and then the news section. If nothing is found there, a professional journalist will start calling the company’s press service for confirmation. Ordinary users can search the Google news section using the company name and the name of the product – a journalist may have already done all the work for you. TruthTeller is a useful service based in the US and supported by The Washington Post – journalists check the most interesting and most popular alleged quotes made by politicians and other information sources. Another useful trick which is worth putting into practice when using Google News Search is sorting search results by date. It immediately identifies the first source of the news, and you can decide just how trustworthy that source is. 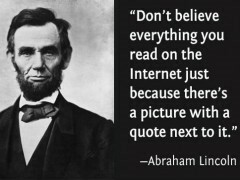 A relatively harmless but particularly widespread online phenomenon is fake quotes attributed to famous people. Searching for them using the text in the quotes is no good – you’ll find numerous copies and nothing that helps identify the original author. Instead, search a collection of quotes of the person in question. Verifying the validity of an image is harder than it is for text. You could simply not bother and just check the text that accompanies the image, or you can use an image search service. The most popular are Google search by image and TinEye. By loading an image saved from a social network, you can see what other sites it has appeared on. 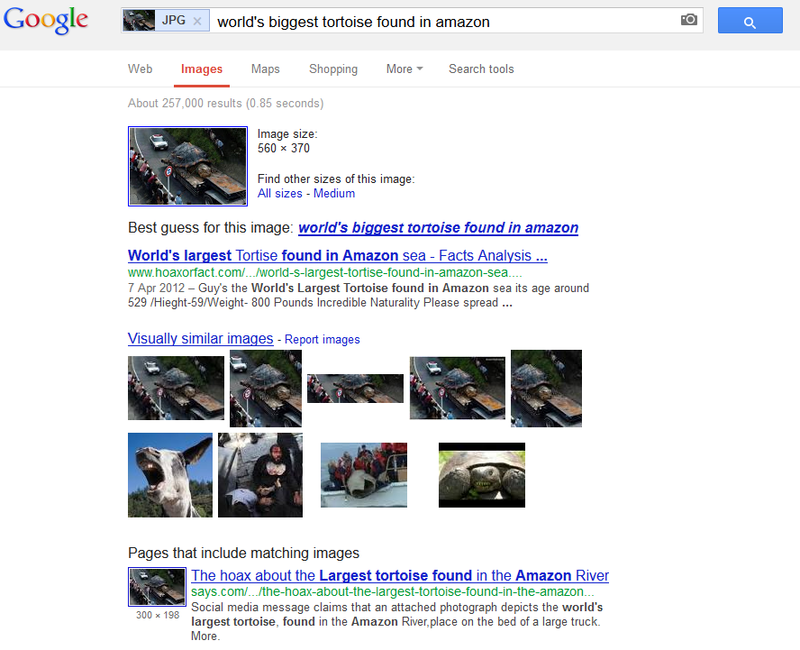 For example, the first results from both TinEye and Google for the popular post about the “world’s biggest tortoise” trace the image back to the Japanese film Gamera the Brave. 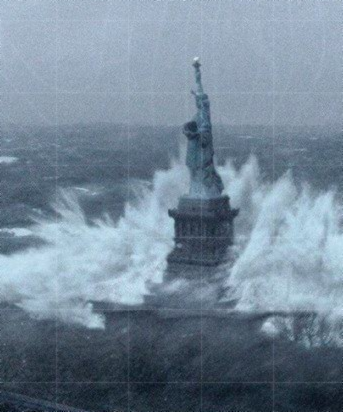 For images showing recent events (as was the case with the impressive photos of Hurricane Sandy), this method may not work, and a detailed analysis of the image may be necessary. Searching for fakes among images is essentially a new forensic science, and even the basics are quite difficult – you can read more about it at the Scientific American. It requires a bit of practice to spot irregularities in the illumination of objects in a picture, slight differences in the tone and texture of a person’s body, paying attention to reflections in eyes, noticing potential join lines at the edges of objects. The dedicated site PSkiller can automate some of these things by analyzing images and spotting the tell-tale signs that a picture has been doctored using Photoshop.